A US federal judge has blocked the US military from sending a Guantanamo Bay detainee to Tunisia because of allegations he would be tortured. It would be a "profound miscarriage of justice" to transfer Mohammed Abdul Rahman ahead of a Supreme Court ruling on detainee rights, the judge said. Human rights groups say the ruling is unprecedented, and the first direct intervention by a judge in such a case. Tunisia has denied Mr Abdul Rahman's claims that it practises torture. However, a report by the US state department published earlier this year said the Tunisian government continued "to commit serious human rights abuses". Citing human rights groups, the report said the Tunisian security forces used sleep deprivation, electric shocks, submersion of the head in water, beatings and cigarette burns. In her ruling made earlier this month but only just unsealed, Washington DC District Judge Gladys Kessler said that Mr Abdul Rahman could not be transferred because he might suffer "devastating and irreparable harm". "In view of the grave harm Rahman has alleged he will face if transferred, it would be a profound miscarriage of justice if this court denied the motion," the judge said. Mr Abdul Rahman has a heart condition and he argued that the 20-year prison sentence awaiting him in Tunisia could amount to a death sentence. His lawyer praised the ruling, which he said was the first time the courts had acted to control the treatment of prisoners at Guantanamo Bay. "The executive has now been told it cannot bury its Guantanamo mistakes in third world prisons," Joshua Denbeaux told the Associated Press. Mr Abdul Rahman was captured in Pakistan and allegedly handed over for a bounty. He was cleared for transfer after a military panel heard his case in 2005. A US justice department spokesman, Erik Ablin, said the government had argued that the district court did not have jurisdiction over the case. The government was now considering its options, he said. The US Supreme Court is due to rule on whether inmates can mount challenge in civilian courts. There are about 340 detainees still being held at Guantanamo, according to the Pentagon. It has transferred or released approximately 445 detainees to other countries. 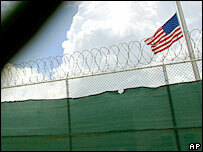 A Pentagon spokeswoman said it tried to ensure detainees were not abused when they were returned to their home states. "Detainees are not repatriated to countries where it is more likely than not that they will be tortured," spokeswoman Cynthia Smith said.